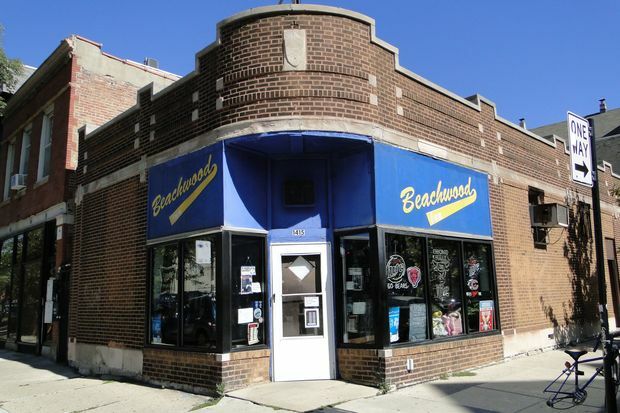 WICKER PARK — Beachwood Inn, a Wicker Park watering hole since 1950, is scheduled to be sold before the end of the week — or should the lawyers "need [us] to look for another piece of paper," by Tuesday at latest — a second-generation owner says. Ongoing for months, the bars impending sale as well as a final party on Wednesday had a more convincing feel compared to other closing events, in October and April. 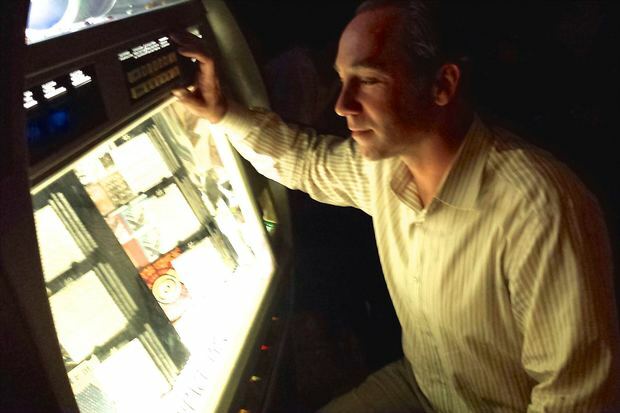 For one, the doors of the venerable dive were locked and only friends and regulars were allowed inside, a nod to security efforts in the 90s when "Chooch," the boyfriend of the co-owners' widowed mother, Lorraine, would keep some of the riff raff out. More proof Beachwood's end is near: co-owner Jim Stepien has signed a lease on a new apartment one block west. "I stay close by. This is ... bittersweet. I'll come back to see what the new people do with it," he said. While the other owner, Bob Stepien, 55, lives in Michigan, his brother, Jim Stepien, 65, resides in an apartment behind the bar at the corner of Beach and Wood Streets, from which the inn derived its name. The two lived in the apartment as children. Their father, Leonard Stepien, who founded Beachwood Inn in 1950, was killed in an armed robbery inside the bar in November 1963. Jim Stepien was 13; Bob was 3. "I was in bed, heard the commotion. My brother started to cry and that's when my dad ran for the back door; they shot him. Right there, in that corner," Jim Stepien said. After Leonard's death, his wife, Lorraine, ran the bar for 33 more years to support her and her sons until she died in 1996. "My mom wanted us to do anything but this. 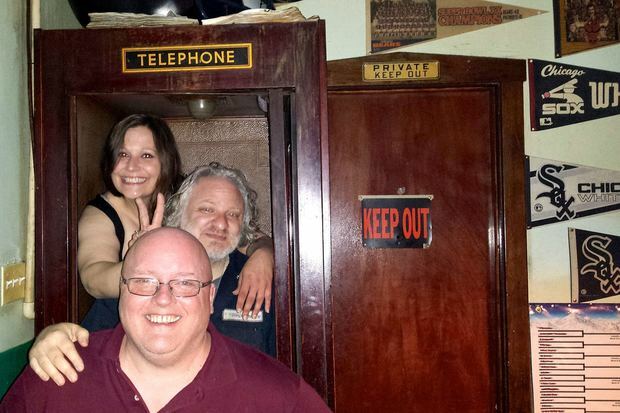 Running a bar is not easy, but it's all I know," said Bob Stepien, who also operates a small bar in Michigan. "She got a lot of help from Lottie Zagorski, and Marie Wuczynski. They helped her with the business side," said Bob Stepien, referring to the female barkeeps behind Lottie's, 1925 W. Cortland Ave., and Marie's Rip Tide Lounge, 1745 W. Armitage Ave. The new owners, whom the brothers declined to name, are planning to tear down the back wall to expand the somewhat narrow bar, a renovation Bob and Jim said they always wanted to do but could not afford. "Mostly, I hope it's going to be a place that I'll want to come visit," said Jim Stepien. 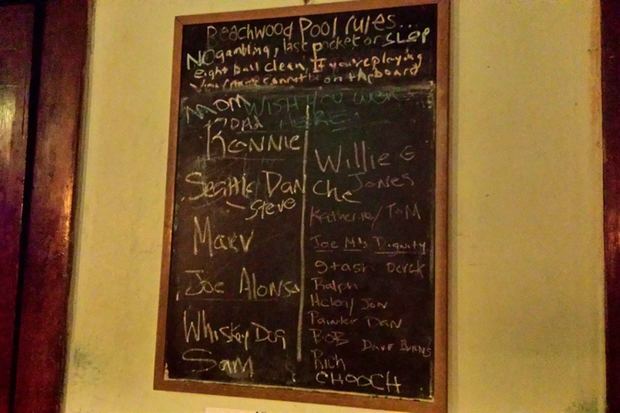 A chalkboard next to the pool table lists names of significant characters in the bar's history, yet more proof that Wednesday really was Beachwood's final night in operation. First on the board: "Mom" and "Dad." There is also Marv, a bartender who died of brain cancer and Marv's dog, "Whiskey Dog," who died of old age. Other important folks include Joe Mielnik, 58, who lives in Old Irving Park, and has been going to the bar for 35 years. Mielnik was among the approximately 25 regulars celebrating the bar's final night. "They are like brothers," Mielnik said of Bob and Jim Stepien. Zarana Patel, a regular since 2002, even before she moved to Wicker Park, said, "This was so much a part of my life. It is an important place to many people." Jack, who declined to share his last name, said, "I like it here because it is no frills but fun. 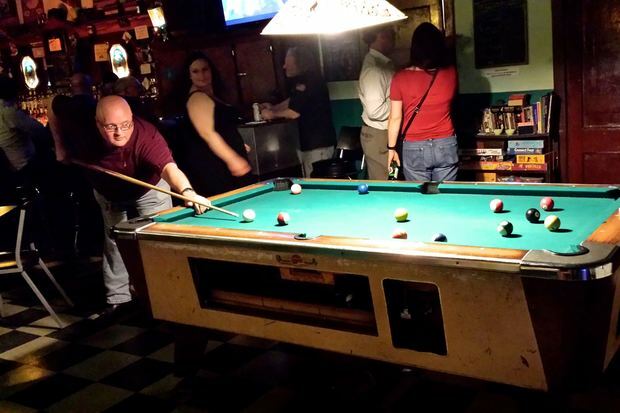 The jukebox with music from the 80s and 80s that we grew up with and this pool table; it is my living room." 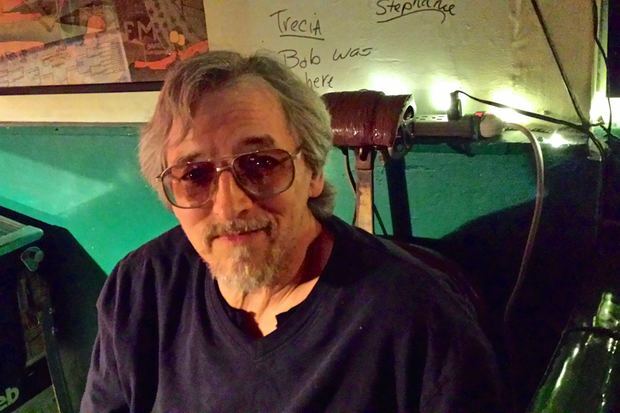 Steve Rhodes, founder of The Beachwood Reporter, a local current events blog named for the bar, has been a regular since the early 1990s. "Bob does not like people but yet he built a community. It's a classic neighborhood bar for people that cuts across age, class, race, sexual orientation, all the lines," Rhodes said. Bob Stepien's friend, Stephanie Skalla, who works for him in Michigan and drove to Chicago for the party, said, "Well, he likes some people." Bob Stepien clarified: "The service industry, let's be honest, is difficult. Customers are a necessary evil. You don't want to spoil them, but you don't want to piss them off, either. If I could make my money without customers, my life would be great." When asked how he feels about Beachwood Inn's sale, he said, "It's been in my life my entire life. It is the anchor that's not going to be there."